Homemade Mashed Potatoes for the Freezer Recipe | Large Family Style! I think one of the reasons that people enjoy my large family freezer cooking days is because I freeze things that folks just haven’t thought about freezing. But I figure if you can buy it frozen at the store, you can freeze a homemade version yourself. : ) And that’s exactly why I decided to share with you this homemade mashed potatoes for the freezer recipe. Mashed potatoes are the perfect side dish for so many meals. They are also a crucial ingredient of my Shepherd’s Pie. So if I’m going to be making them for Shepherd’s Pie, I might as well make as many as I can and enjoy them for other meals, too. I bulk cooked 20 lbs of potatoes in my new 14-quart pressure cooker the night before I wanted to mash them. You can find the steps for how I cook potatoes in the electric pressure cooker here. You can also boil your potatoes or bake them in the oven. Besides the electric pressure cooker, boiling potatoes with the skins on is my next favorite way to cook potatoes for homemade mashed potatoes or easy potato soup. You can see how I boil potatoes here in my easy homemade potato soup recipe. Now, on to mashed potatoes for the freezer. Hot, buttery mashed potatoes with little work involved. Okay, you have to get them out of the freezer and put them in a pot. But mashed potatoes are worth that little bit of work, right? Throw all the cubed, cooked potatoes into a super-sized mixing bowl or a large stock pot. Use a hand mixer to mix everything in. 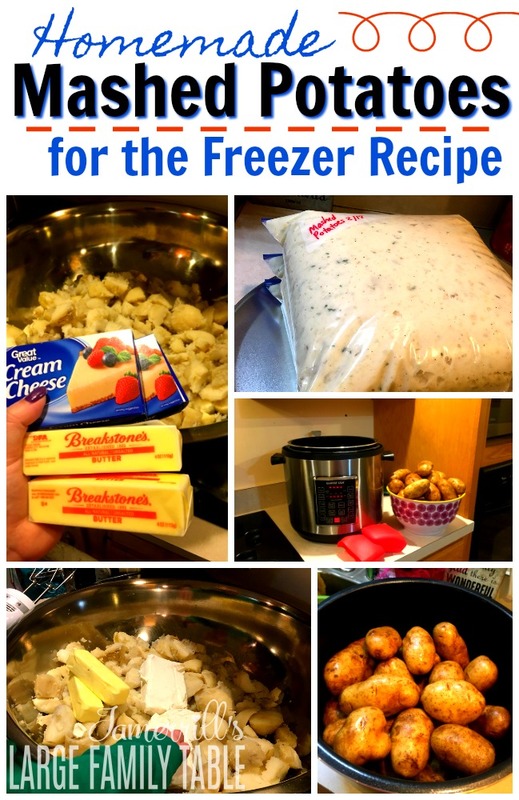 Freezing Directions: Fill multiple gallon size freezer bags 3/4 full of the mashed potato mixe. Squeeze out any additional air. I was able to fill four gallon size freezer bags. 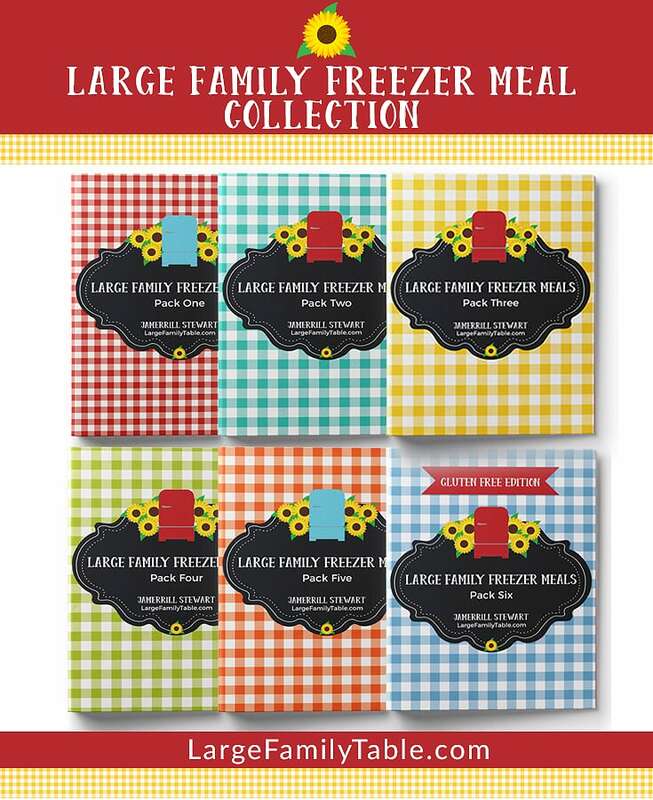 Lay the filled freezer bags flat on several baking sheets to flash freeze in the freezer. In a few hours, take the flat, frozen mashed potato bags and stack them in your freezer until needed. 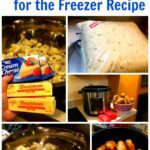 Preparing Homemade Freezer Mashed Potatoes: The night before you need the freezer mashed potatoes, just move them from the freezer into the refrigerator. The following day, you can heat them up in several ways. You can put them in the slow cooker on low for 2-3 hours, stirring as needed. You can also microwave them or heat them on the stove top. We like our potatoes a little bit lumpy but if you don’t, just mix and mix until all the lumps are gone. This big Mashed Potoatoes for the Freezer Recipe is part of my new 30 Large Family Meals in 10 Hours vlog from my latest large family freezer cooking day. 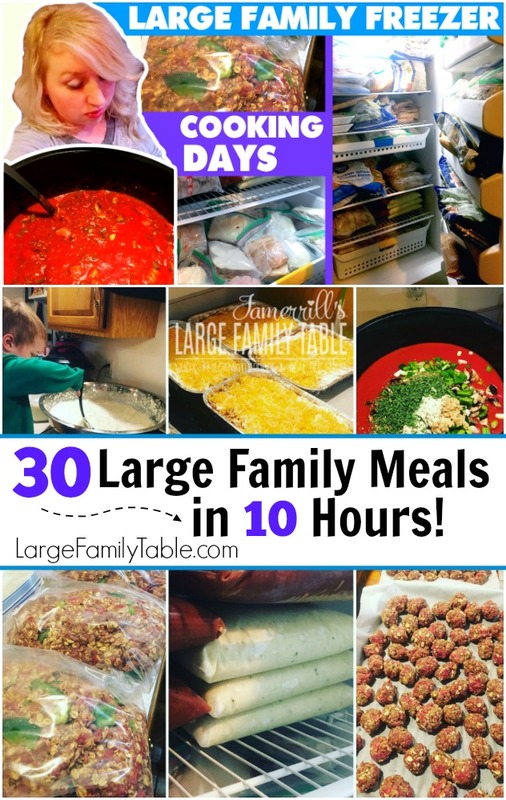 When you give this large family recipe a try please head on back here and let me know how it worked out for you!